Most people know that breastmilk is the best food for babies, but they also think that formula milk is just as good. Therefore, most people have no qualms about feeding their babies formula milk even though they are fully capable of breastfeeding their babies. Some people, especially the older folks, even believe that formula milk is better than breastmilk. Well, here’s the truth : Although formula milk is sufficient for the growth of a baby, it is nowhere near being a substitute (definitely not a close substitute) for breastmilk. 1. Breastmilk is ‘alive’. It contains antibodies that help protect your baby from diseases, and depending on the exposure of the mother, the antibodies will vary from mother to mother, from day to day. Formula milk does not contain antibodies that protect your baby from diseases. 2. Breastmilk changes according to your baby’s need. The breastmilk of a mother with a 1 month old baby is not the same as the breastmilk of a mother with a 6 months old baby. Breastmilk changes as your baby grows to meet the needs of your baby at the various stages of his life. Formula milk, on the other hand, is the same all the time, except when you switch from infant formula to ‘follow on’ formula for various age groups. 3. Nobody has yet been able to ‘map out’ the exact and complete ingredients (or components) of breastmilk. This is also because breastmilk is always changing. That is why formula milk is not even close to being a close substitute for breastmilk. Hence, feeding your baby formula milk is not giving your baby all those ‘wonderful ingredients’ that the formula companies claim that formula milk has. It is actually depriving your baby of all the rest of the ingredients present in breastmilk but not in formula milk. Formula milk actually had quite a noble beginning. It was to reduce infant mortality rate and save lives of orphans and sick babies who had no one to feed them when breastfeeding was about the only way to feed a baby. Man had always been seeking alternative means to feed babies. Sometimes, it was for difficult situation, where the mother of an infant was forced by circumstances to work and thus unable to feed her baby. Sometimes, babies lost their mothers. Sometimes, it was for purely selfish reasons, e.g. high society women often did not nurse their own children as it would interfere with their other duties and obligations, and as they wrongly believed, affect their figure and beauty. Sometimes, it was due to ignorance and the (wrongful) association of breastfeeding with obscenity. During the days when formula milk had not been invented, infant mortality rates were high where infants were not able to be breastfed. Feeding infants with any other things such as barley water was almost certain to lead to the death of the infants. Hence, physicians worked to develop artificial means of feeding, and over time, formula milk developed and indeed helped to reduce infant mortality to a certain extent (where breastfeeding was not possible). However, partly due to the close association between doctors, physicians and infant formula, people began to think that infant formula were better than breastmilk. As mentioned, even without the need to look for alternative ways to feed babies, people had always been searching of alternative means of feeding babies. Formula milk provided such alternative as a convenient way of feeding babies without subjecting the mothers to the various inconveniences of breastfeeding (e.g. ‘indecent’ exposure). Formula milk companies began to realise that they were sitting on a fat cash cow and they should milk the cow as much as possible. Hence, they began to aggressively market formula milk as a substitute for breastmilk and an even better alternative to breastmilk. Thus, began the commercialisation of the formula milk industry. With industrialisation, the trend towards abandoning breastfeeding and adopting formula milk accelerated. Feeding babies formula milk was portrayed as ‘modern’, ‘scientific’ and ‘intelligent’. The feminist movement led more women to place greater emphasis on career, to strive for ‘independence’, and formula milk was seen as a means towards this end. Unfortunately, as more and more people gave up breastfeeding and switched to formula milk, more and more babies died. The situation was worst in the 3rd world countries where poverty, illiteracy and lack of sanitary environment, especially clean water, led to millions of babies dying from malnutrition (when mothers add more water to the formula than they were supposed to in order to ‘stretch’ and save costs), from diseases (arising from the lack of antibodies protecting babies who were formula fed), and from diarrhoea (due to unsanitary preparation of formula milk, most often due to unclean water). This is not unique to the 3rd world countries. Even in developed countries, many babies died for the same reasons. The aggressive marketing efforts of the formula milk companies included giving out ‘free samples’ of formula milk to mothers when they delivered their babies in the hospitals and sending ‘milk nurses’ to visit mothers and in the guise of giving them childcare advice, convinced the mothers to feed their babies formula milk. Unfortunately, breastfeeding is such that once you stop, there is almost no way of turning back. As mothers started feeding their babies with formula milk, their own supply was affected, thus leading to a new phenomenon called the ‘insufficient milk syndrome’ which came about only after formula milk became widely marketed and adopted. Once they are started on the ‘formula route’, they were stuck and had to continue forking out money to buy formula milk to feed their babies. Think of the disastrous result in the 3rd world countries where people hardly had enough money to feed themselves! And as mentioned earlier, this did not just apply to the 3rd world countries. The same scenario could be found in developed countries as well. Formula milk companies misled people to think that formula milk as better than breastmilk, when in fact, formula milk was basically a whole series of trial and error efforts by the formula milk companies and even until now, it is at the trial and error stage. Often, the ‘errors’ were not realised until many years (as long as 25 years) have past. I cannot list out all the things that the formula milk companies have done here. There are so much of them. The whole modern day struggle between formula milk companies and breastfeeding advocates is so political and complicated that it will probably take an entire website to cover the whole issue. If you are interested, ‘Money, Milk and Madness’ by Naomi Baumslag is a good read on this subject and is available in the National Library. 1. Formula fed babies have a higher risk of diarrhea and infection, juvenile diabetes, inflammatory illness, communicable and infectious diseases, celiac disease, Crohn’s diseases, ulcerative colitis, cholera, neonatal hypocalcemic tetany, obesity, impaired antibody response to vaccines, SIDS, allergies, asthma, heart disease and cancer later in life, and higher frequency of apnea and bradycardia. 2. Mothers who do not breastfeeding – in other words, mothers who feed their babies formula milk – have a higher risk for urinary tract infections, breast cancer, ovarian cancer, cervical cancer, chronic hepatitis, hip factures and osteoporosis. 3. Formula fed babies experience less than optimal growth and neurological development compared to breastfed babies. Breastfed babies also tend to have higher IQ than formula fed babies. 4. 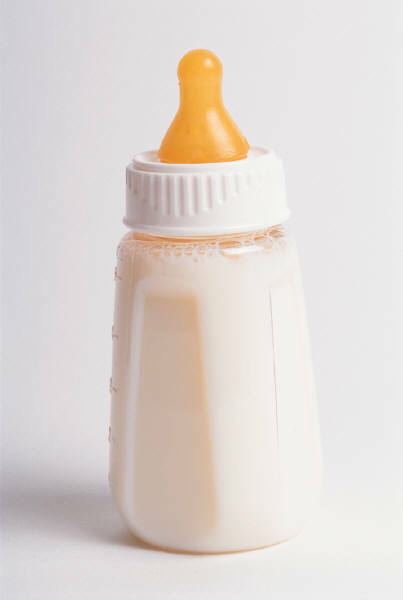 Contrary to the term ‘formula milk’, there is no ‘formula’ to infant formula milk. Every brand has its own ‘formula’. 5. Certain components in formula milk are either unnecessarily high in quantity or hard to absorb by the body. This means that the body has to deal with the ‘excesses’ and leads to strain put on organs such as the liver and kidneys. E.g. Although breastmilk has lower iron content than iron-fortified formula milk, the iron is of better ‘bioavailability’ and thus easily absorbed by the body. 6. The main ingredients in formula milk include skimmed cow’s milk (which is the by-product of butter making) and whey (which is the by-product of cheese making), and vegetable oil such as palm and coconut oil. The reason for using these ingredients is not so much because they are good, or they are similar to breastmilk component. Goats milk, for instance, is a closer match to human milk than cow’s milk. The main reason for using these ingredients is because they are easily available and they are cheap; so instead of throwing away the by products, why not make full use of them? 7. Formula milk has far less than what breastmilk can offer. Whatever good things formula milk has, breastmilk has them in the correct form and proportion. On the other hand, there are loads of things that breastmilk has but formula milk does not have. As I said earlier, giving your baby formula is not giving him all that ‘wonderful ingredients’ that the formula companies claim that the formula milk has. It is actually depriving your baby of all the rest of the wonderful things that breastmilk has but formula milk does not have. All information on breastfeeding can only be distributed through or conducted by healthcare professionals. Infant food companies, or their representatives may not pay for or conduct mothercraft-like services (eg. home care programmes, hotlines, soliciting mothers, baby clubs, newsletters, talks on infant care). In hospitals, infant formula cannot be distributed as routine, and discharge packets cannot contain infant foods. Product samples of infant food is not allowed. Product advertising and promotion of infant food including point-of-sale promotions; baby shows; display of samples, pamphlets and posters at polyclinics, maternity wards, paediatric clinics and family doctors’ practices are not allowed. The currently trend of ‘Mommy Milk’ like Anmum is all a ploy by milk companies also. Mothers, whether pregnant or nursing do not need to take milk supplements like Anmum. By eating a healthy, balanced diet, mothers can get all the necessary nutrients cheaply and healthily. Should you feel guilty if you are already feeding, or have fed, your baby formula milk? The reality is that we are all imperfect beings living in an imperfect world. There are many reasons why women cannot/will not breastfeed. The obstacles to breastfeeding are many. Nobody has the right to judge. I know that a lot of breastfeeding enthusiasts tend to make mothers who formula feed their babies feel like they are bad mothers for giving their babies something ‘bad’. I am certainly not in favour of putting people on guilt trip. Any guilt trip, not just concerning feeding. All mothers want to do their best for their kids and we are usually the first to beat ourselves up for any ‘bad’ thing that happens to our children. The last thing mothers need is for other people to tell them that they have failed. As if we don’t already feel bad about all the other thousands of mistakes we have already made and are going to make throughout our children’s lives. How would I feel if I had fed Dominic formula? By now, after learning so much about breastfeeding and formula milk, I guess I would feel a sense of regret. But what I have done would be out of my best intention, even though ignorant. Then I will give up formula and breastfeed the next one. Move on in life and no point regretting past decision. If you know everything that is you need to know and consciously choose to formula-feed your baby, then don’t let anyone make you feel bad about it. You make the best decision for you, your baby and your family under your particular circumstance. You should not feel bad about it. Feeding is but one aspect of motherhood. It is not an indication of how good a mother you are.